These homemade double chocolate brownies from scratch with vanilla cream cheese frosting is like a bite of heaven. If you are in a hurry, you may use a fudge brownie mix; so the cupcakes stay moist when baking. Make the homemade chocolate brownies using the recipe below and bake them in paper lined cupcake/muffin tins. You may sift powdered sugar over them or use your favorite frosting. I think these cupcakes are awesome when you top them with my homemade marshmallow frosting. PREHEAT oven to 350 degrees. Place paper baking cup in each of 12 regular-size muffin cups, or grease bottoms only of muffin cups. In a large bowl, beat the butter, vanilla and sugar until light and fluffy. Add the eggs, one at a time, beating after each addition. NOTE: Coat the chocolate chips in a little flour before putting them in the batter so they wouldn't fall to the bottom of the pan. Sift the flour, cocoa powder and salt together and gradually add to the chocolate mixture until just blended. Fold in the chocolate chips and spread into the prepared pan. Bake for 25-30 minutes, or until a toothpick inserted in the middle comes out clean. Cool completely. Combine all frosting ingredients together and whip until light and fluffy. 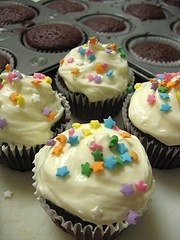 Spread frosting over cooled brownie cupcakes and decorate if you wish.